Public Website and SharePoint. Integrated. An existing Imaginet customer required an integration point from their public website into an existing SharePoint Online Intranet. Imaginet’s SharePoint team delivered a customized solution that allows public users the ability to query specific information in the SharePoint Intranet, while keeping the data abstracted and secure. A national logistics company with a focus on trailer chassis leasing engaged Imaginet to create an integration point between their public website and a small sub-section of data within their SharePoint Online Intranet. Their goal was to create a curated search function for chassis registration documents that are available to the public, while keeping the two sites separate and keeping the intranet secure. Their existing public website (written in WordPress) was to remain on the same platform with minimal customizations. A key concern of theirs was to enable specific search requirements for a large number of documents. 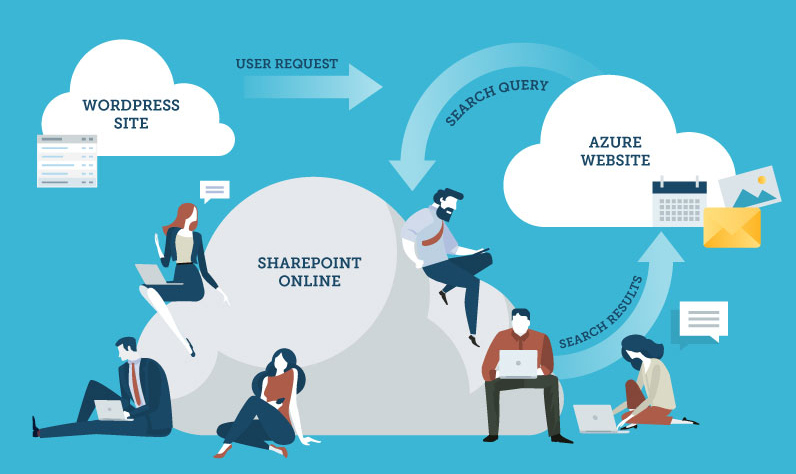 Imaginet was able to leverage the Office Add-In framework to create a secure connection into SharePoint Online from a dedicated web site hosted in Azure. By using Azure as the common hosting platform, it ensured a better query performance in SharePoint Online. Results from user queries displayed using the Add-In connection. Select documents from the results became downloadable via a proxy on the web site. This was to ensure that existing SharePoint Online security stayed in place while documents were accessible to public users. Integration with the public website was via a search form added to the site. This small custom HTML form directs queries from the users to the new website in Azure to display results. This allowed for minimal interaction with the public website. To meet the specific search requirements, using the default SharePoint search service was not an option. Individual queries made directly to the document location was necessary to select documents. Extra configuration was also necessary in SharePoint Online to ensure proper query performance through large sets of documents. Solutions for handling large sets of documents while maintaining proper performance.